Hurricane Irma sent a storm surge ashore in Chokoloskee and Everglades City that left about 100 homes condemned. 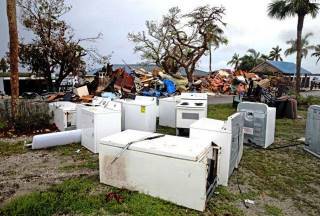 In the lead-up to Irma, an Associated Press analysis found that the number of Florida homes covered in high-risk areas had dropped by 15 percent in the previous five years. Fewer than half in hazard zones were protected from flood damage. Wright blamed the problem partly on flood maps that, like hurricane tracking maps, can mislead homeowners on actual risks. By contrast, when Harvey slammed the Texas coast, the national flood program insured 70 percent of the homes in moderate flood zones in Harris County. After the storm passed, 60 percent of the claims came from those moderate zones, proof that storms don’t always follow the contours of a flood map, Wright said. “That’s true in areas of Florida as well,” he said. So far, flood claims for Irma in the state have amounted to $850 million — about 28,000 in total were filed. The payouts included about $100 million in the Florida Keys, $30 million in Miami-Dade County and $7 million in Broward County, said spokesman John Mills. Jacksonville received more than $130 million. Private insurers paid off another 900,000 claims for other damages, with just over 1,700 in flood claims, valued at nearly $8 billion. In addition to flood claims, FEMA paid for hotels and housing assistance for 27,000 households. About 1,100 families remain on hotels Mills said. As part of its overall, the flood program is also taking a look at rates to insure fairness. In Florida, rates in moderate zones are affordably priced at less than $500 annually. While they go higher in high-risk areas, Wright say still don’t cover payouts, accounting for the $20 billion debt. “We paid claims with a very high proportion of discounted rates — so the people who are not paying the actuarial price for the cover — and that’s the way Congress designed the program. So what are we doing?” he said. Securing more re-insurance and transferring risk with tools like catastrophe bonds should help avoid piling up more debt, he said. The agency is also examining properties on coasts and in flood plains that have been repeatedly rebuilt “that we probably shouldn’t be providing cover on,” he said. Like with windstorm insurance, there’s also a push to attract more private insurers — although that also raises concerns about private companies cherry-picking policies and leaving the NFIP on the hook for the riskiest properties. There is also debate over whether the agency should be paying to rebuild expensive property on vulnerable coasts. Wright said that decision would be left to the states, but the Keys made a good case for successful rebuilding. A day after the Keys reopened following Irma, he toured Marathon and Big Pine.